hello again! we’re so excited to be back here on design*sponge sharing our recent craft and diy adventures with you all. last weekend we did a little event at our shoppe in conjunction with readymade magazine that was so fun we thought we’d share it with you. artist neil freese (whose work graces the cover of the current issue of readymade) taught us all how to make our favorite classic camp craft: god’s eyes. we were so inspired that we couldn’t resist whipping up a few lanyard keychains (swapping out plastic “boondoggle” for ultrasuede tape). they were a blast to make, and would also be perfect father’s day gifts. click here for the full instructions for both projects or just click “read more” below. 1. tie the end of your yarn to the middle of one of the sticks. 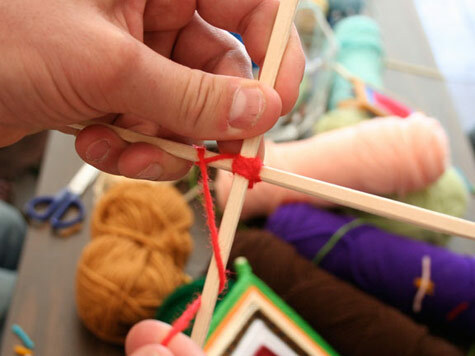 2. cross the other stick over the first and bind them together by wrapping the yarn around the centers of the sticks in an “x” pattern a few times. 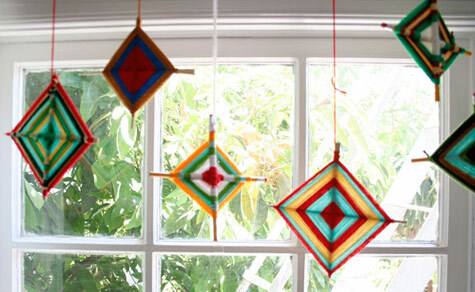 3. begin wrapping the yarn in a diamond pattern by sending it over and around one stick, then over and around the next. continue in the same pattern until you are ready to change colors. 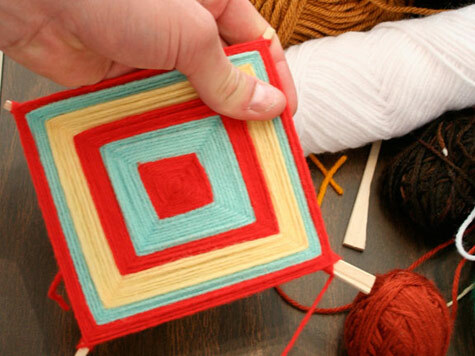 4. to change colors, simply cut your yarn and tie the next color to the end. continue wrapping as before. 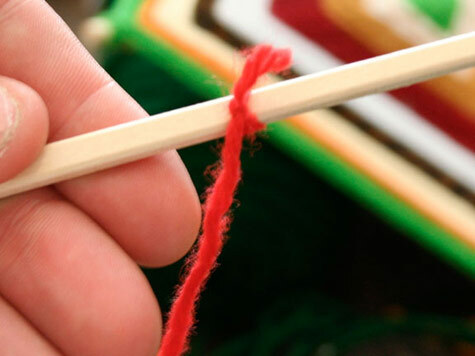 5. when you’ve done all your colors and are ready to finish, cut your yarn, wrap it around the top of one of the stick ends and tie it off with a knot. 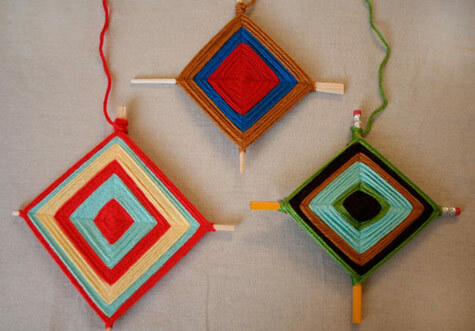 be sure to leave yourself enough slack so you can hang your god’s eye in a window or from the nearest tree branch. 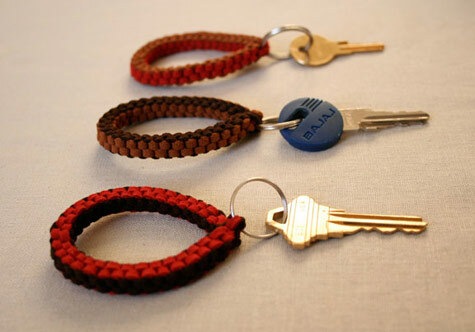 1. begin your keychain by making an “x” with the 2 pieces of ultra suede. 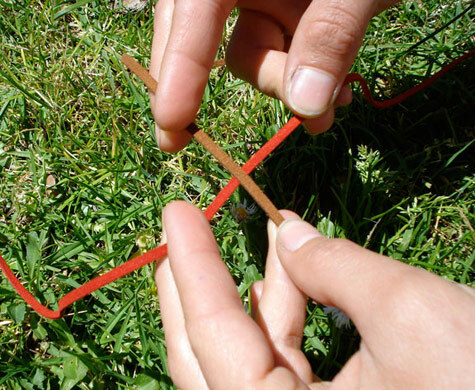 2. create two small loops with the bottom color (A, red in our pictures). 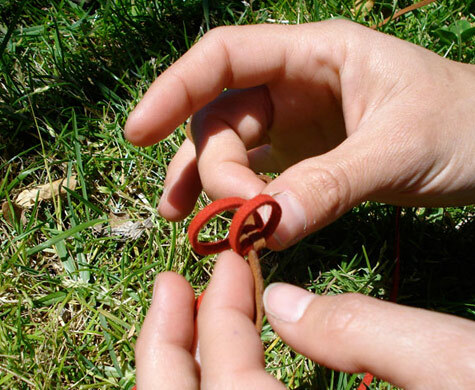 3. slide one end of top color (B) over the closest loop and through the furthest. Repeat with other end of top color. 4. pull all four ends of ultrasuede taut to create a nicely shaped weave. 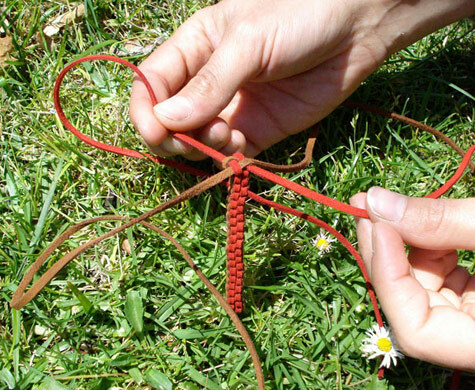 5. continue create loops and weaving until you have approximately 4″ of woven lanyard. 6. insert the keyring through the loop at the beginning of the lanyard. 7. tie loose ends around keyring and tuck in using a metal yarn darning needle. 8. trim off any remaining ultrasuede. Awesome. 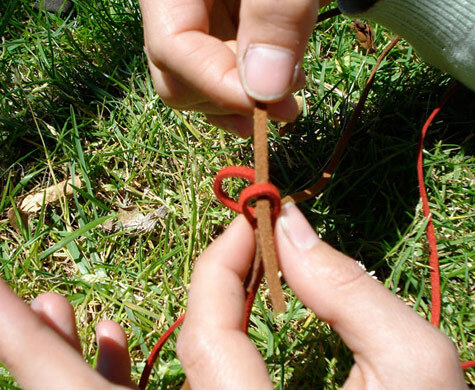 I was not a camp kid so I never learned any of these necessary craft skills. Time to catch up! This is pretty cool. Thanks I also never did camp crafts. oh lanyards – how many hours of my youth did I spend making you?! 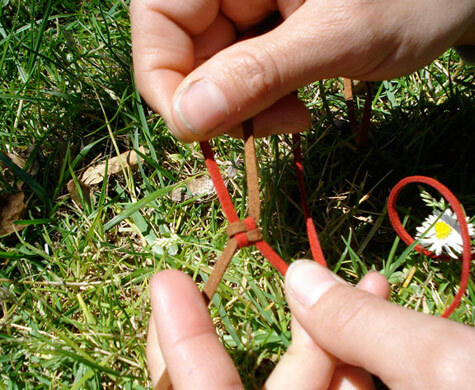 Memories from Camp Wright as a kid! We made so many things with that plastic flat stuff we called gimp and I was very fond of the box stich that is shown! Finally! The perfect “valance” for my kitchen. :> I love how you displayed the eyes. i never made god’s eyes, though. they look like fun! I used to be a master lanyard and friendship bracelet maker. It’s fun to see them in a grown-up material. Oh man, did these bring me back :) Of course, I never remember mine looking so good… excellent use of photography for the step by step tutorial! very fun! i’ve been wondering when the god’s eye was gonna make a comeback. so happy to see these. A friend made this one for me. Here in Brazil is called “Eye of God”. I made god’s eyes a few months back with the 6 year olds I teach – until then I hadn’t seen them since the 70s, glad to see them. 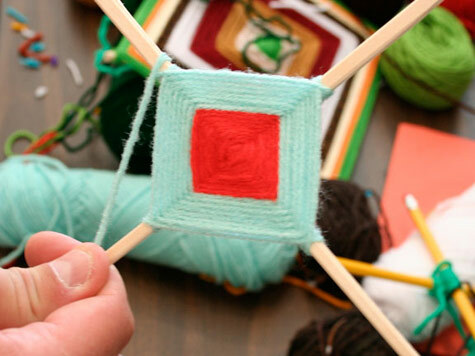 They’re a great way to use up partial rolls of yarn. Oh, I used to make these lanyard keychains as a kid in the 1970’s every summer at our local park for arts and crafts days. I can almost smell the leather through this post. Thanks for the memory!!! I too loved making things like this -with “gimp” the flat coloured plastc stuff. We just called this stitch “square” there was also “flat” and “round”. Thanks for the memories of Camp Tapatoo in Ontario Canada!